(TRAVPR.COM) UNITED STATES - January 2nd, 2013 - January 3, 2013 – Weirs Beach is one of the top destinations for tourists visiting New Hampshire and WeirsNH.com is your travel guide. Experience a good combination of breathtaking views, scenic getaways, a variety of year round activities and the finest accommodations available. Located in the heartland of NH, Weirs Beach is a great choice if you are planning on exploring all that New Hampshire has to offer. Whether it be hiking, biking, climbing, and boating in the summer to skiing, snowboarding, snowmobiling, and ice fishing in the winter “The Weirs” is in the middle of it all. Weirs Beach area hotels and motels have hundreds of rooms available that feature basic amenities such as refrigerator, microwave and free Internet access, allowing hotel guests to constantly update their social media life. Weirs Beach is one of the most affordable areas to vacation for a day, weekend, or for the week, making it as the top choice of many domestic and foreign visitors. Visitors won’t have a difficult time getting to Weirs Beach it's only 10 minutes away from the Laconia Airport, and about an hour away from the Boston-Manchester Airport. Weirs Beach is just minutes away from other attractions like Funspot Arcade, Monkey Trunks Ziplines, Lakes Region Casino and Mount Washington Cruises. Kids and couples will also enjoy dining at restaurants with festive ambiance such as Tower Hill Tavern, Heart's Turkey Farm, The Broken Spoke Saloon, The Lobster Pound, and many more. 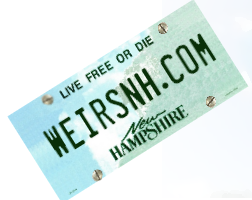 Visit http://www.weirsnh.com for your next getaway. For more information, please see http://www.weirsNH.com.